Do You Have a Milk Protein Allergy? Many children are diagnosed with cow milk allergies within the first few years of life. While uncommon, some adults can develop symptoms of a cow milk allergy as well. Cow milk allergy is an allergy to milk protein, which is different than lactose intolerance. Symptoms of a milk protein allergy usually occur quickly after consumption of a food item that contains cow’s milk. These symptoms can be a mild rash to severe anaphylactic shock which requires immediate medical attention. If you fear you have a milk protein allergy, make sure to talk with your doctor or registered dietitian. Along with the attention of your healthcare provider, you should also consider confirming your milk allergy with a test that detects IgE allergies and IgG food intolerances. These food tests can give you a complete picture of foods that bother you. You may want to avoid all animal-based milk until your doctor can give you clearance on these items. What should I do if I have a milk protein allergy? As with any allergy, it is imperative that you avoid all products that contain milk. This includes items that are baked or cooked with milk-containing products. 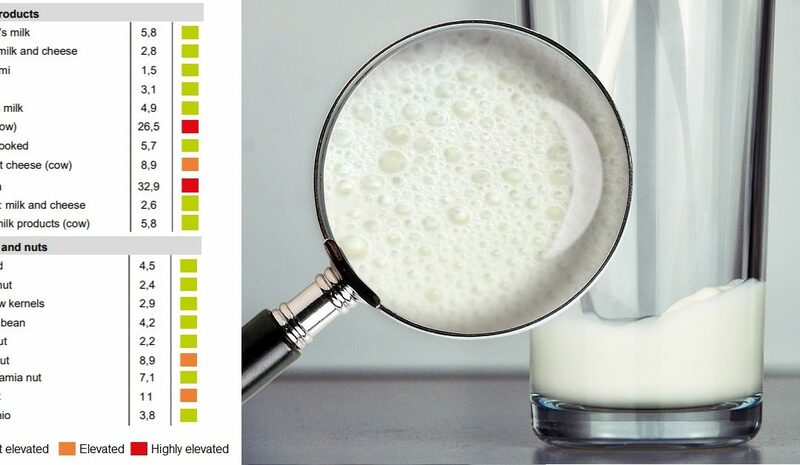 If you suspect you consumed a food that contained milk, monitor and manage your symptoms. In severe cases, you may need immediate medical attention. At Home: When eating and cooking at home, you control how your meals are prepared. Make sure everyone who cooks in your household is aware and understands how to prepare meals for you. One simple mistake can be dangerous to your health! Eating Out: When out at restaurants for fast food places, it is essential that you alert the staff that you have a milk allergy. Restaurants are becoming increasingly adept to cooking for people with food allergies. Now that you know how to test for a cow’s milk allergy and what foods to avoid, be your own advocate and protector of your health. Refer back to the lists above and remember the tips provided for eating at home, eating out, and grocery shopping. Above all, avoid foods containing cow’s milk. Always make sure you have an epinephrine auto injector with you and know how to use it. Teach your friends and family how to use it if you can’t do it yourself.